The 89th installment of the rotating Carnival of Nuclear Bloggers is up over at my friend Dan Yurman's IDAHO SAMIZDAT nuclear blog. This rotating feature is the best way to see what the world's top pro-nuclear blogs are reporting and saying about the nuclear energy industry, and about nuclear education and history. I always recommend that my readers look through the Carnivals for interesting perspective and news analysis you can't find elsewhere. Here is a link to today's official NNSW site posting. Safety has been a prime consideration in nuclear plant design since the very beginning. 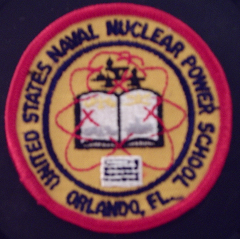 The United States' commercial nuclear program has its original roots in the safest program ever created - that of the US Navy. Since the construction of the Shippingport Atomic Power Station, a culture of respect for the requirement of safety has existed in the US nuclear industry, pervasive among reactor vendors, suppliers, owner-operators, architect-engineers, and among regulators. Look here to see some information about the newest commercial plant design which will be built in the United States - the Westinghouse AP1000 - and how the design deals with a total loss of offsite power and onsite power, known as SBO or Station Black Out. A while back an AP piece questioned safety at US nuclear plants. See this video produced by the NEI to describe safety at US nuclear power plants. Some writers have further questioned the 40 year lifetime of plants (so clearly explained in the previously linked video) because they think that they have found a probable cause in terms of reactor vessel embrittlement. This however is not the case at all and we can prove that if we read this post. Here is the Nuclear Energy Institute's page on Safety & Security at nuclear plants. Finally for today, here at NEI's website is a great page with comments on nuclear energy made after, and in light of, the accident at Japan's Fukushima Daiichi nuclear station. These are statements by people in place to make law and policy, from all walks of life and 'both sides of the aisle' as it were. Safety is absolutely the top priority in any successful nuclear energy or nuclear related operation; those who cannot or will not adhere to the best practices are removed from the operation as soon as found - and this happens every day. Those few persons who cannot respect a fifty plus year heritage of safety and respect are not damaging any operation through their absence. 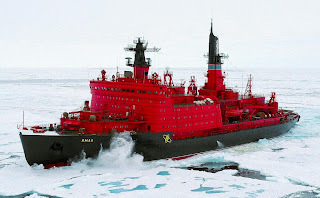 Labels: "national nuclear science week", "safety"
In the previous post I gave the briefest overview of the history of the Russian fleet of nuclear powered icebreakers. In this post I'll go into detail on the powerplant designs used in these ships. The Lenin was built in 1957-1959 with three pressurized water reactors which were designed by a group known as OKBM which originally was formed as a part of the Gorkiy Artillery Plant. The organization has a complicated history (as do all Soviet design bureaus) but basically was the same group responsible for the design of the first Soviet submarine reactor, prototype for the NATO "November" type, which first achieved criticality in September 1957. 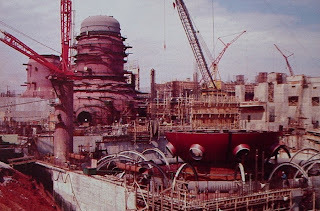 Lenin was originally constructed with three 90 MWt two loop pressurized water reactor plants of type OK-150. Let's take a look at the construction of the powerplant. 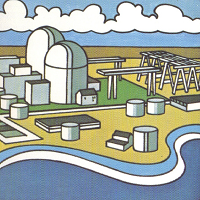 First, we see from The Atomic Energy Deskbook a cutaway model illustration originally provided by the Atomic Energy Commission. This blows up very large, so make sure to click on it. In this view, we can see the heavily shielded reactor compartment in the center. 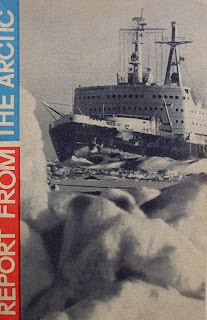 According to the Soviet propaganda booklet "Report From The Arctic," 1964, which includes many press stories about travels on the Lenin, this shielding weighed over 2000 tons and was over 17 inches thick. It included both steel and concrete. 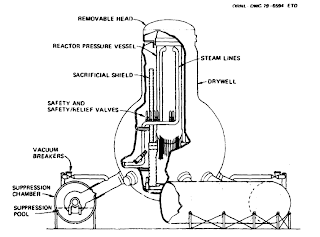 Each of the reactor plants had two loops; in each loop was one steam generator and one main coolant pump. This plant as originally designed had a number of details that can only be described as being very developmental and early, and which were designed out of any later plants. (Some of these kinds of things hold true for early US plants as well.) Let's take a look at a few primary plant components to illustrate the design better. 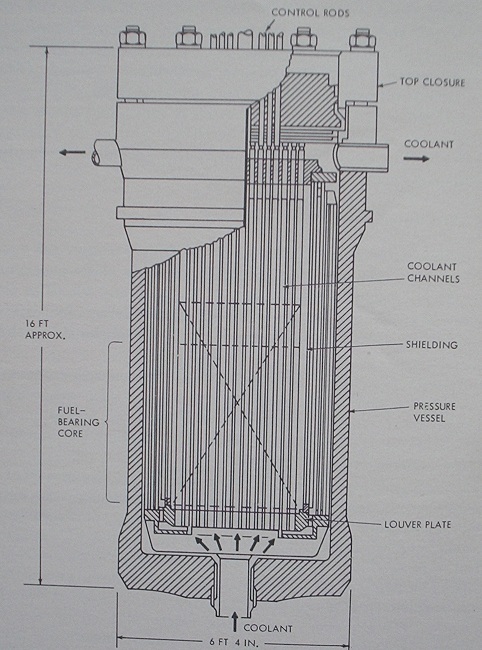 Above is a cross section view of the internals of one of the OK-150 plant's reactor vessels. Notable instantly is the single coolant inlet at the bottom of the vessel; this violates the tenet that no primary coolant system leak should be able to drain the reactor vessel of coolant. This was designed out of later plants. Note also that one inlet is used for both loops; flow is joined from the loops at a "T" junction below. The core used 5% enriched uranium, and was single pass. 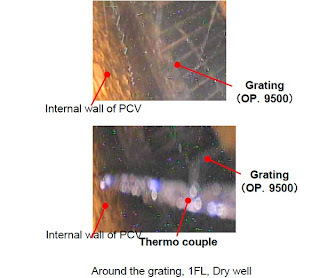 Reported primary plant characteristics included pressure of 2940 psig, hot leg temperature of 616F, and cold leg temperature of 478F at full power. The above illustration is from "Nuclear Propulsion for Merchant Ships", A.W. Kramer and published by the AEC. Let's use another illustration from that volume to show the plant layout better. 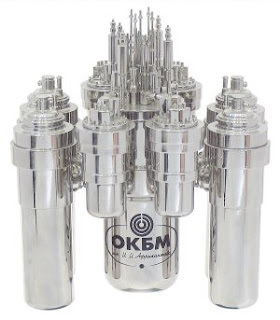 Above, side view of Lenin's original OK-150 reactor plant. Note the main coolant pump motors protruding through the plant shielding, one fore and one aft. There is also a backup coolant circulating pump shown. Note again the "T" junction under the reactor for coolant inlet. The compact nature of the steam generators is also notable. 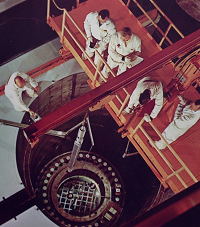 As in some other early plants elsewhere the space above the reactors was accessible during critical plant operation; this allowed work on the control rod drive mechanisms. Below is a view of this space from "Report From The Arctic" showing all three reactors abreast of each other. In the model shown earlier it's possible to see two engine rooms, fore and aft of the reactor compartment. These house four steam turbine driven generator sets. Lenin used turbo-electric drive; the screws of the ship were driven by large electric motors. 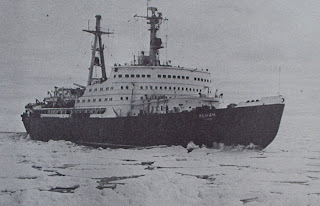 This allowed for rapid changes in propulsion power and rapid reversing, necessary for icebreaking. Each turbine drove two DC generator units through a reduction gear. 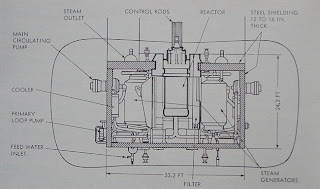 The DC generator units were not identical, however; one unit had both armatures wired in parallel and powered the center propeller while the other set had two separate armatures, one powering each of the two outer propellers. Thus, the center propeller had twice the power of the outer ones with a total of all three at full power of 44,000 horsepower. 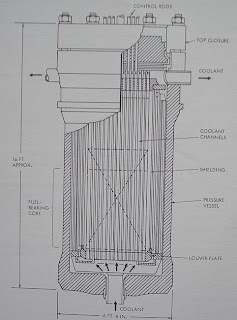 In order to accommodate rapid power changes on the propellers without having the reactors load follow immediately (which they could not, due to large thermal inertia due to the relatively low fuel enrichment) the Lenin was provided with steam dumps around the turbines directly to the main condensers. Item: On the Lenin as originally built, the feed pumps, condensate pumps, condensate boosters, and seawater pumps were ALL driven by steam turbines. This is in contrast to the NS Savannah, roughly contemporaneous in design, on which only the main feed pumps were steam driven, all others being electric. The Lenin did not require all three reactors to develop full power. 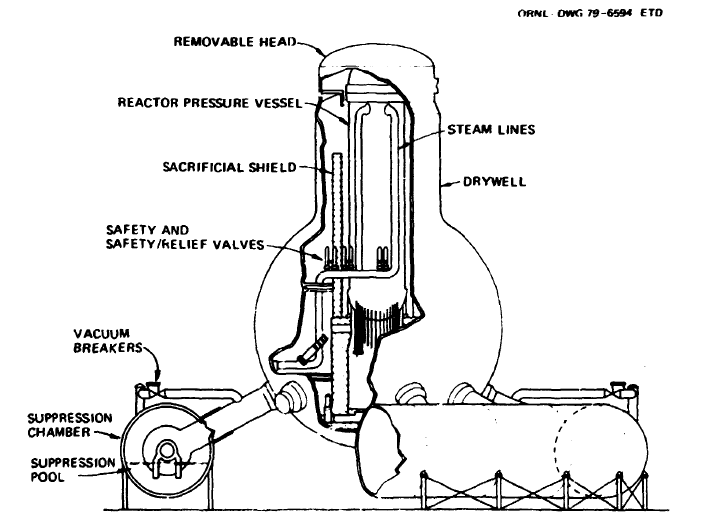 The ship normally had only two reactor plants critical at any time; in fact, the original design called for two but it was found that a third could be installed with almost no penalty (only the weight of that plant itself, no increase in shielding, or plant length or width overall) and so three were used in order to provide reserve in terms of operational time between refuelings. 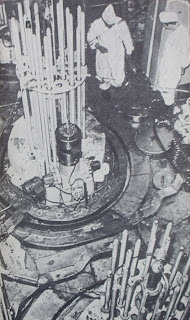 A number of serious difficulties were encountered with the powerplant in the middle 1960's, and the Lenin was out of service for a few years while the orignal OK-150 reactor plants were removed and replaced with two OK-900 plants. One volume in the APR collection indicates that Lenin had its turbines replaced as well, although the photos of the ship as a museum contradict this. Below, from OKBM's site is an illustration of what all of the new generation icebreaker powerplants look like. Above is the KLT-40 reactor plant developed from the OK-900 / OK-900A. 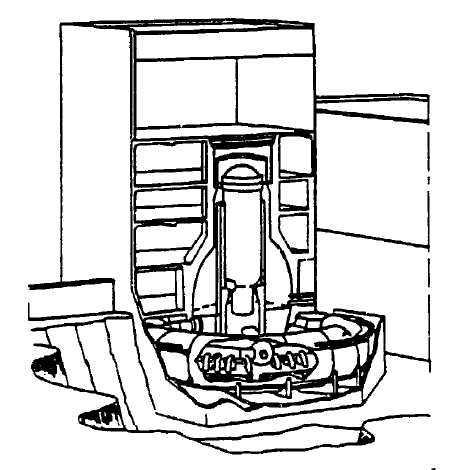 Note that the plant is very compact; no components penetrate the reactor compartment; no penetrations are below core level on the reactor pressure vessel; four loops, one pump each; vertical steam generators. Sharp readers with nuclear experience who looked at the photo links on the previous National Nuclear Science Week installment on this site will have noticed the Reactor Plant Control Panel depiction, pictographically, on board the Lenin of a powerplant essentially identical to this one, exactly as one would expect after the rebuilding. The next two ships after the Lenin were originally built somewhat like the modified Lenin; they incorporated two OK-900A reactor plants. The OK-900 as installed in the Lenin was rated 159 MWt; the OK-900A was rated 171 MWt. All of the large icebreakers up through the 50 Let Pobedy use two OK-900A plants. One volume in the collection here indicates that Arktika and Sibir had much different turbine plants from the Lenin, however. 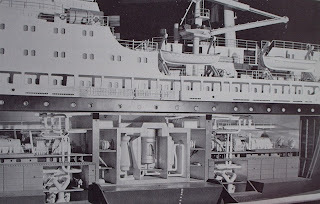 Each ship had two 37000 HP turbines which drove the electric generating equipment instead of four small turbines. That volume does not state whether these are generators or alternators, but alternators are much more likely at this size and power rating. The new icebreakers after the Lenin (of the large type, that is) have a shaft horsepower of 75000. The two smaller 'shallow draft' icebreakers have KLT-40M reactor plants of similar general design and rated the same (171 MWt) - but only one reactor plant per ship instead of two. The containership "Sevmorput" has one KLT-40 rated slightly lower at 135 MWt. All are turbo-electric drive. I hope you've enjoyed this brief look at the powerplant designs of the Russian nuclear icebreakers. It's a very narrowly covered topic - and it should not be, because this is one job that is tailor made for nuclear energy. 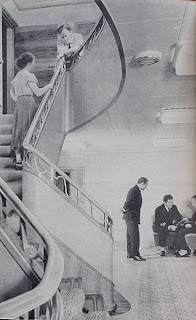 Below, from "Report From The Arctic," public space ladder well in LENIN. Labels: "icebreaker", "lenin", "national nuclear science week", "nuclear icebreaker"
Today's topic is well introduced with NNSW's official daily post. Did you guess what this job is? Well, this photo is of the Russian nuclear powered icebreaker LENIN in the Barents Sea. That's right - the Russians (at that time, the Soviet Union or USSR) built and operated the very first nuclear powered icebreaker at the end of the 1950's (the ship was ready for trials in the fourth quarter of 1959) and after a long time with only the Lenin proceeded to construct a complete fleet of nuclear icebreakers and even one nuclear powered container ship! Many great photos of the Lenin - now preserved as a museum ship - are available. Here are a few in the APR collection. Above is an AP Wirephoto from September 15, 1959 showing the Lenin traveling down the Neva River in Leningrad on the way to sea trials. 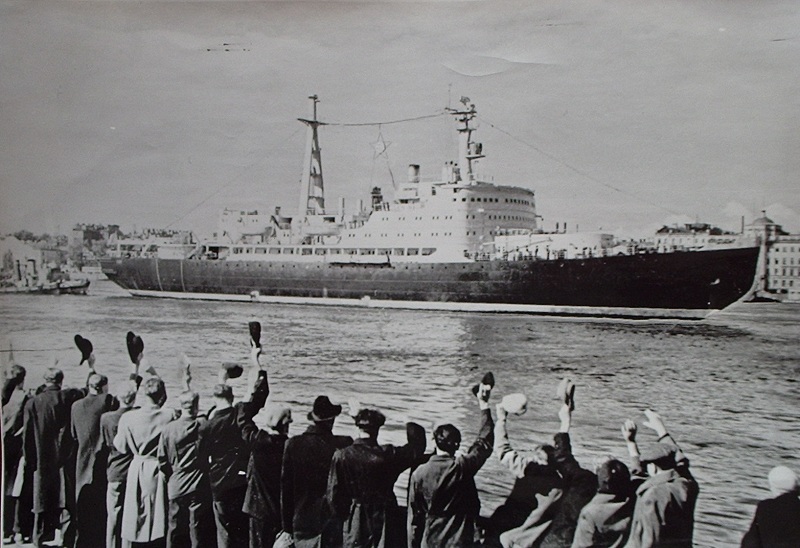 The ship had been completed at the Admiralty Shipyard in Leningrad. Above, special 1978 Soviet post card depicting the Lenin - complete with postage stamp also depicting the Lenin. According to The Atomic Energy Deskbook, the Lenin first performed actual icebreaking work on the North Sea Route during the 1960 shipping season. The Lenin is reported to have been capable of breaking solid ice up to 11 feet thick, by actual account. The ship could break less than this in continuous motion, and would break the thickest ice by backing away and ramming the ice until it split. Actually, "split" is not entirely accurate since the armor plated bow of the Lenin was designed to ride up over the ice and partially crush it while splitting - giving rise to a rhythmic bow up - bow down motion when breaking fairly thick ice at moderate speed. The Lenin's stated displacement was 16,000 tons. 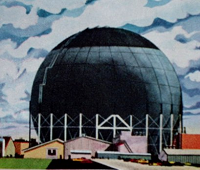 The ship had three pressurized water reactors when built (it was modified later) and could develop 44,000 horsepower total with three screws (or, propellers.) This amount of power equated to a force at the bow of the Lenin against the ice of about 300 tons. The Lenin served for about a decade before it was decided due to operational and developmental problems to replace the reactor plant. The three original reactors were replaced with two newer models and the ship returned to service. Below are links to some wonderful resources covering the Lenin. 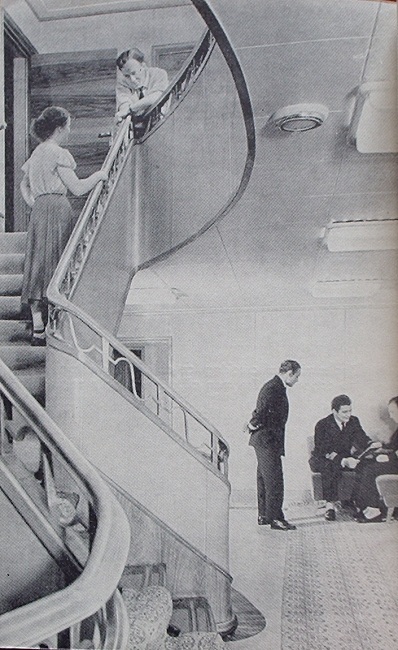 It should be remembered that the Lenin was intended to be both a working ship and a showpiece, and as a result the interior of much of the ship is decorated in the best Soviet late 1950's style. I strongly encourage everyone to visit at least the first link of this set! 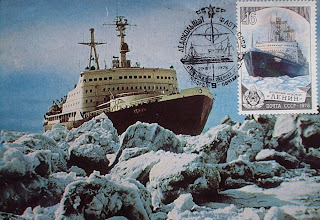 As I mentioned earlier, the Lenin was the only nuclear icebreaker in the world for many years. 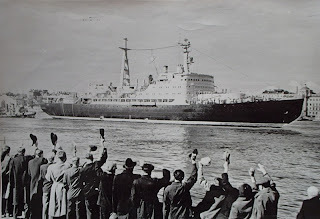 While the Northern Routes did see a lot of shipping prior to the advent of nuclear icebreakers, and while there had been a number of famous conventional icebreakers prior, there was a time before industry and population really needed one hundred percent year-round shipping. 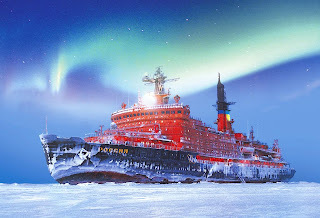 As this became more desirable, the USSR made plans to build further nuclear icebreakers and plans for a fleet were made. And there is also one nuclear powered containership with icebreaking capacity itself, SEVMORPUT, built in 1988. These ships are built for some of the most rugged conditions imaginable. They can ram and back out of ice fields to ensure the path is clear. The ships, if wedged in, have high speed ballast pumps and beam tanks that can actually rock the ship violently side to side to get it unstuck. The ships carry provisions for many months at sea without pulling in - the ARKTIKA set a record for such operations by staying out of port, in operation for 357 continuous days! Of all these ships, Lenin, Arktika, and Sibir are out of service and retired. All of the rest are in service providing a highly reliable, continuous service supplying the needs of people and business - in a way that could only be done by nuclear energy, which allows the ships to remain at work continuously without needing to refuel or return to port. This is one job that nuclear power is excellent at; there are of course many others. Finally for this section, a couple of the press photos from ROSATOM showing the nuclear powered icebreaking fleet. Above - Russian ROSATOM nuclear icebreaker YAMAL. Above - Russian ROSATOM nuclear icebreaker ROSSIYA under the aurora borealis. Click here to get to ROSATOM's fascinating website - learn much more! And, coming up shortly -- Atomic Power Review will present "Nuclear Icebreakers 101" - a technical but not too complicated look at how these ships really work. Look for this entry later today! Labels: "national nuclear science week"
The update on APR concerning nuclear careers has actually already been in place for several days. All readers, both long time and new are encouraged to look through the newly expanded link list at the right side of every page on Atomic Power Review. Very many new companies have been added to this list - and each of those employs a very wide range of people with very wide educational and operational experience. When we think about nuclear energy, we think primarily nowadays about safety. What gets left out is the vast number of people employed and involved when a nuclear plant gets built. Utility companies must contract for everything that has to get built at a nuclear plant which the utility will own and operate; the utility also has to hire and train all the workers at that plant. Architect-Engineer firms are hired to lay out the whole plant, and design its structures and features. Contractors are hired to actually perform the construction work, using a massive array of materials both generally available (such as concrete) and specially manufactured by other contractors specifically for the plant. A reactor vendor (like Westinghouse or General Electric) is responsible for detailed design and fabrication of the nuclear plant itself, often referred to as the Nuclear Steam Supply System (NSSS) or in some quarters the "nuclear island." These vendors also subcontract a massive number of jobs to other companies who fabricate components... such as electric (or in the old days, steam driven) pumps. Frequently the utility contracts a different vendor than the reactor vendor to supply the electrical portion of the plant, as distinct from the nuclear island. Radiation Health workers are also employed to monitor the exposure of persons working in the plants, and these workers further require specialized equipment to record exposures. If we just think briefly about the vast number of trades involved in the above kinds of examples, the vast number of engineers and specialists, we might begin to see that nuclear energy can offer work to a much wider variety of workers than just simply those with a nuclear specific education. I strongly encourage everyone to browse through the list at right - which is by no means complete - and just think of the wide variety of skills required by nuclear energy. It really is kind of mind blowing! Tomorrow- the answer to yesterday's secret question! Don't forget to check today's post on the official NNSW website. Day 1: "Get to Know Nuclear"
Today is the first day of NNSW, and as we look at the official website for NNSW we find that the topic of the day is "Get to Know Nuclear." Nuclear energy (the primary focus of this blog) has been in the news quite a bit lately - and we have found very clearly as indicated by readers' questions and comments that there is indeed a vast gap in knowledge (at least in the United States) when it comes to things nuclear. In keeping with today's basic theme, let me just make a few points and state a few facts about nuclear energy and related topics so that they are clear to even the youngest readers we might have. -Nuclear energy is made possible by the loss of mass that occurs when atoms are split and that mass is converted into energy. -In nuclear reactors, we use the heat energy produced by fission of atoms to heat water and make steam - steam just like you would use in a coal burning plant. -Nuclear reactors do not take in any air. They also do not give off any exhaust. -Nuclear reactors are loaded with enough fuel that they can run at full power for many months or longer. Some kinds of reactors are not refueled for many years. -Radiation - tiny, invisible particles that are given off by nuclear reactions - can cause damage to your body. But radiation cannot make YOU radioactive; you will not give off radiation if you are exposed to radiation. -Nuclear reactors can suffer damage just like any other kind of machine man has built, although in terms of the number of hours reactors have run world-wide without damage and injury they are less likely to suffer failure this damage than cars, airplanes, trains, buses or ships. In other words, every kind of machine around you that's larger than a refrigerator is more likely to fail and cause injury than a nuclear reactor is. -Even in the worst possible situation a nuclear reactor cannot explode in the way that nuclear weapons do. Why not? The uranium or plutonium in a nuclear weapon is extremely pure so that the effect of compressing it will be what we know as a nuclear explosion - a "nuclear yield." A nuclear reactor is composed of thousands of other kinds of parts like fuel matrix material (many tons of it) and fuel tubes and support structures and control rods and guide tubes and support plates to hold all those parts... and much more. In other words, even in the worst situation there's so much other stuff in there that you can't get any kind of pure enough nuclear fuel to allow a nuclear explosion. It just cannot be concentrated enough being so outnumbered by many tons of other materials. -Nuclear energy is only partially environment-dependent. Unlike solar and wind energy, environmental input has no effect whatsoever on how much power the reactors can develop. With those two, we all know that the sun goes down at night and the wind does not blow all the time! 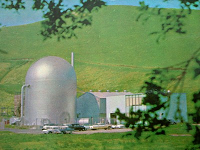 Nuclear energy CAN be affected by environmental conditions on the other end of the process - for example, some nuclear plants cannot generate full power on very hot days because they need lots of cool air or cool water to cool plant systems and condense steam as part of the power cycle. -Nuclear energy does not produce any greenhouse gases. Or carbon emissions. These are just some facts about nuclear energy. Some of these may stimulate further discussion among teachers and students. This week I will be presenting details on a job that nuclear energy has been doing with overall top notch success since the end of the 1950's.. and it's a job most people all over the world don't know about. Perhaps you can guess what it is! 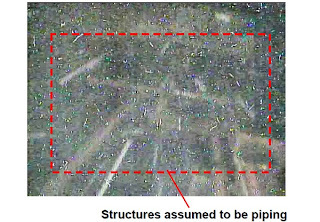 TEPCO has completed the first examination inside any of the primary containment vessels at Fukushima Daiichi, using a boroscope inserted into No. 2 plant's dry well. Below is a graphic explaining the location, practiced a few days back at No. 5 plant. Click the image to enlarge it. 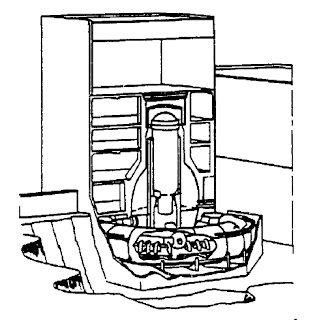 Below for perspective is an Oak Ridge National Laboratories illustration showing some of the same components from the side. 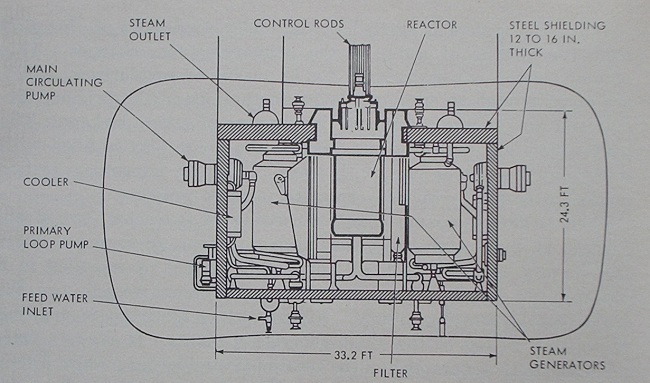 Of course, that image shows only the internals of the dry well and suppression chamber; below we can see these as they are positioned in the reactor building overall which will give new readers a better idea of what the first, overhead explanatory diagram was really showing. 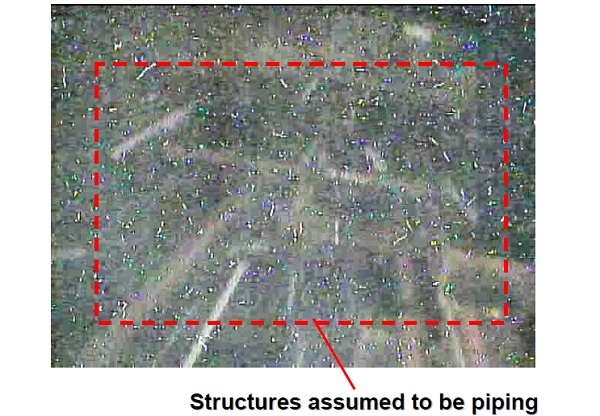 Having shown all of this, we can proceed to the views TEPCO has released which are actually just video still frames. Nothing was determined by these views; the location and condition of fuel is unknown, as is the condition of the bottom of the reactor vessel and primary containment vessel. The views, TEPCO press releases, are labeled as to their location and in one instance as to elevation above sea level in centimeters ("OP 9500"). 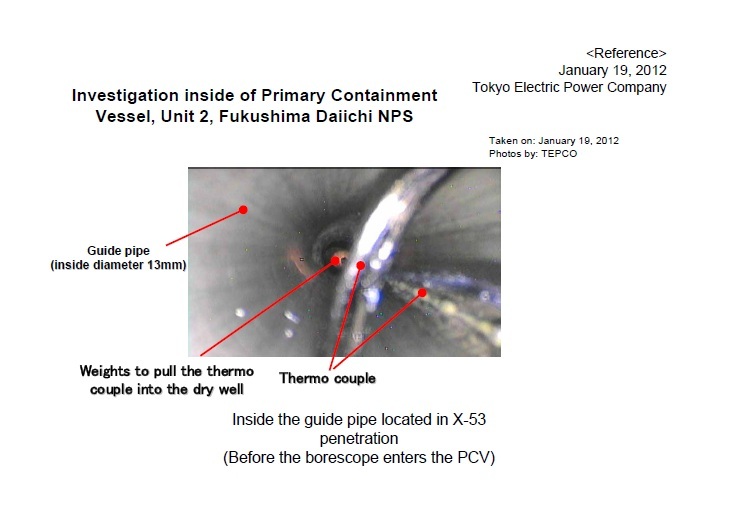 As noted, TEPCO is no more sure of the condition of the lower end of the reactor vessel at No. 2 plant now than before. Further invasive attempts will be required to ascertain any sort of real estimate of the situation below the reactor vessel. I find the ability to make this post MOST gratifying. Actually, that title is somewhat misleading only in the sense that the poll shows a very clear, decided support for nuclear energy in the UK. I told you so! And there will be more such polls to come in other places. Some of these - with very similar results - have already been done in the United States. Labels: "fukushima", "opinion", "poll", "support", "UK"
Frontline on PBS: "Nuclear Aftershocks." NEI has made two posts today in response to the Frontline special (you can translate that as 'hack job' if you'd like) on nuclear energy. I would refer my readers who may have watched this special to these two posts, for starters. Twitter updates are being made in real time by APR, by NEI, Entergy Nuclear, AREVA, and many other entities. Go to APR's Twitter page using the link in the Twitter box on this website and then find your way to NEI's tweets! Note: APR continues to be on a reduced status as my father is seriously ill in the hospital. Please refer to the APR Twitter feed box for news items that I post and link to occasionally and please also refer to the other blogs in the auto-update blog roll whose new posts appear automatically in order of time / date posted. Labels: "frontline", "hack job", "nuclear aftershocks", "pbs"
Regular readers may have noticed a very recent 'radio silence' on the part of Atomic Power Review. We are experiencing a medical emergency in the family and, as a result, I have no time to devote to things atomic for the moment. Readers are strongly encouraged to use the 'blog roll' on the right side of the APR web page to see updates from other pro-nuclear bloggers; use of the extensive link list of nuclear industry and blog websites will also help. Readers should expect one of the extensive "Review" updates on this site when I can return to it, which with any luck could be within a week. It certainly is interesting that two days after this blog noted what appeared to be a complete and total shutoff of anything other than the daily press releases and compulsory responses (in Japanese) to NISA in terms of communication from TEPCO, another new TEPCO press release video in the Explanatory Series of Videos has appeared. I'm not going to take credit for this, although I should. Anyway, this new video is the third video of the third set of videos. 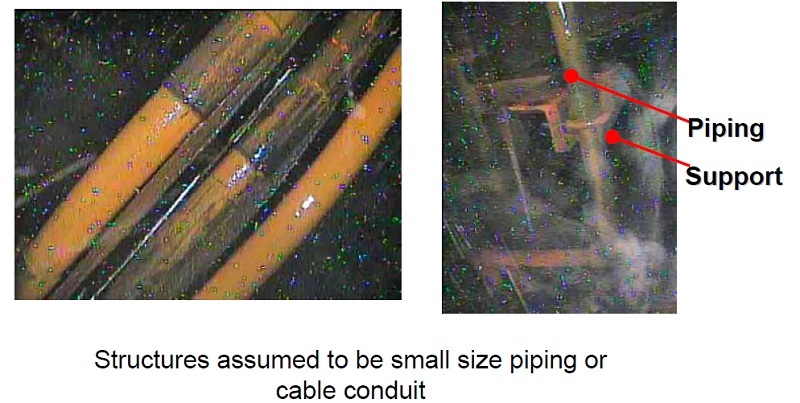 The third set discusses radioactive emission and contamination at the Fukushima Daiichi site and outside of it as a result of the accident and of post-accident complications; this new video covers a wide range of the sampling locations, the measurements taken at those locations, and the general trend of those measurements. Spoiler: The trend is downward in all cases. This video is the first in the series to display any sort of serious production issue. In this video, after some of the coverage is complete, the narration's description of graphics and the video depiction of those graphics, paginated in numerical order, becomes disjointed. In other words, the narration is a page off from the video. This is a bit annoying the first time through.. however, I must point out the analytical value of the many graphs presented and their general downward trends. These are good ammunition against those who keep saying that the cores continue to melt, or that recriticality has occurred, or that contamination is still pouring into the ocean. All untrue, and all laid out in this video's graphics. Go to APR YouTube Channel to see the new video by clicking here. Labels: "fukushima daiichi", "video", "youtube"
Babcock & Wilcox has clearly divided its nuclear business into two operating entities as of today; one concerned with conventional nuclear plants, and the other concerned with the new SMR (Small Modular Reactor) business that it is developing under the Generation mPower name. Nuclear Lunch, Fukushima, and other issues. Yesterday marked the third Ohio meeting of Nuclear Bloggers, an event that saw the full two hours we'd set aside totally filled with a regular future meeting schedule planned. The participants were Dan Yurman, who writes not only the blog "Idaho Samizdat" but who also writes for ANS Nuclear Cafe and for Fuel Cycle Weekly; Leslie Corrice, whose site "The Hiroshima Syndrome" includes a well done Fukushima update section; and myself. We believe that only here in Northern Ohio is it possible to assemble three pro-nuclear bloggers in one spot. Are there other places this is possible? Or, can we make it four or more people here? Let me know through the comments if either is possible. We carried on a number of widely disparate discussions - and of course touched on Fukushima Daiichi. 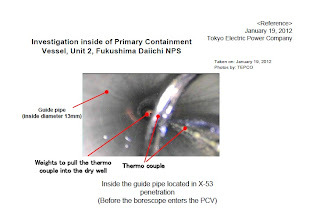 I mentioned the abrupt cutoff of the wide range of press relations material TEPCO had been releasing around three to four weeks ago; Leslie had noted the same thing. Dan mentions that with TEPCO about to be nationalized in all probability, there might be a cutoff of what could be perceived as needless communication to the press. Further, I might add today, with the declaration of "Cold Shutdown" by the owner-operator, the regulatory body, and the government, there may be a perceived lower need for constant communication. Speaking of Fukushima Daiichi news... here are two news items from today. -TEPCO has begun to reduce the nitrogen injection rate at No. 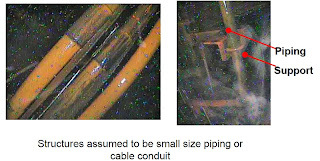 2 plant in order to lower the containment pressure (injection rate lowered but gas handling discharge or suction rate maintained the same) as a preparatory step to drilling the containment for insertion of a camera probe as detailed here a short while back. -There is exactly one news headline at the moment stating that the Japanese government has instructed TEPCO to prepare details on what would be needed to repair the Fukushima Daini nuclear station. This is curious considering the Fukushima Prefecture governor's statement that he will not allow further nuclear plant operation in is prefecture. One might imagine TEPCO would like to obtain revenue from operating these plants, and one might imagine the Japanese government would like to get manufacturing infrastructure up again (as well as electric power in the prefecture for recovery) which both run counter to that governor's wishes. We will have to see if the report spreads outside pay-walls and is actually true. One of our discussion topics yesterday was the fact that the Japanese cannot survive forever without nuclear energy. Their manufacturing base requires a great deal of electric power; further, the nation cannot operate as a fuel importer. Nuclear energy has been one of the cornerstones of Japan's economic structure for decades and the loss of it now (if plants are kept idle by legislative action, not by safety related regulatory action) could lead to the collapse of Japan's economy. Of course, there are some who feel that the Japanese government also cannot assume the debts of TEPCO should it be nationalized -- making it all the more essential that TEPCO's remaining intact plants be restarted (once quake and tsunami proofed, that is) so that some revenue can begin to come in and add black ink to the books even if it does not erase the red. It does seem to this writer that the Japanese who are now intolerably anti-nuclear cannot see the bigger picture, at least for the short to medium term. Labels: "bloggers", "fukushima daiichi", "fukushima", "lunch"
Carnival No. 86 is now up! NEI Nuclear Notes is hosting this week's Carnival of Nuclear Bloggers. This rotating feature contains posts from the best pro-nuclear bloggers and is always a great way to find out what is on their minds and what is happening in the nuclear industry (and in the regulatory bodies) that matters. According to this report, the Office for Nuclear Regulation (the British nuclear regulatory body) has indicated a satisfactory result for the stress testing of the nuclear plants in that country. Labels: "office for nuclear regulation", "stress tests"
There is absolutely no doubt in this writer's mind that the vast majority of what was reported in the mainstream press in the months immediately following the Fukushima Daiichi accident was not only incorrect, but seriously flawed. Consultation of both anti-nuclear speakers such as Arnie Gunderson, and people with no nuclear knowledge whatsoever, like Michio Kaku, was regular and normal in those days. The Union of Concerned Scientists, which actually is an organization with agendas (such as being anti-nuclear) and not some oversight panel, was also consulted and quoted. I think we all see how their predictions worked out. No contamination in the US; no deaths in the US; no radioactive fallout blanketing the Pacific islands; no massive hydrovolcanic explosion due to 'China syndrome' melt-through; no evacuation of Tokyo. No spent fuel pool fires, or prompt criticality in a spent fuel pool (this last being a wonderful Gunderson gaffe) or recriticality of damaged reactors. None of it. So far, none of the pre-apocalyptic horsefeathers these people and organizations spread around have come true. The major problem of course is that anyone listened to them. The wide distribution of such clearly anti-nuclear (and thus strongly biased) trash as "news" bothered many in positions to know better - but the actual occurrence of the accident itself seemed to be enough to give them a brief season of credibility. We, on the pro-nuclear side, were saddled with sentiments on the order of "well you said this could never happen and now it has so why listen to you?" None of us said that this could never happen. That's a straw man put out by people who just have absolutely no clue WHAT we've said because, for thirty or more years, they haven't listened. So now we find ourselves in a world where several nations have decided to dump nuclear energy in a knee jerk reaction to something that happened all the way around the world and doesn't affect them one iota (Germany, and others.) Fukushima Prefecture in Japan is probably permanently non-nuclear now (its governor, as reported here at APR has indicated he will not allow any further nuclear plant operation) but the rest of Japan is up in the air. The tendency of plants shut down for inspection or maintenance not to restart (except for one plant) is bothersome as well. South Korea has over 17000 Mw of nuclear plant capacity on line. 'Fuel poverty' in England can only be alleviated by nuclear and they know it. Slovakia: 50% of electric capacity is nuclear, and it's passed stress tests. I could go on and on with links to show places where nuclear energy is moving forward, but suffice it to say that the entire world is NOT anti-nuclear. Recent polls in the United States still show a positive for nuclear energy in acceptance. Even with the horrible mainstream reporting on nuclear energy and the Fukushima accident, and the rampant celebrity anti-nuclearism as well. It is in the context I've outlined above that I await the results of this symposium. I've been assured by Dr. Stricker that we'll have as much information from the event as possible. I should also note that each of the speakers has a paper linked right at the AAAS page; these provide great information on the topic. It is about time that the press came to terms with its poor job in reporting technical issues; perhaps this AAAS symposium will wake some of the people in the mainstream media up. Labels: "anti-nuclear", "fukushima", "press", "reporting"
An update on the Russian submarine fire. There are new photos and reports out which indicate that the fire which recently occurred while a Russian Delta IV class SSBN was drydocked was actually inside the submarine... at least, inside the superstructure or outer hull. The fire appears to have taken place inside the outer hull, but outside the pressure hull. The following site has some interesting photos but it should be made clear that what we appear to be seeing here is an outer hull cut allowing access to the forward main ballast tanks and NOT to the submarine's torpedo room. The actual job that was being performed is not clear, although use of wooden scaffolding is clear. 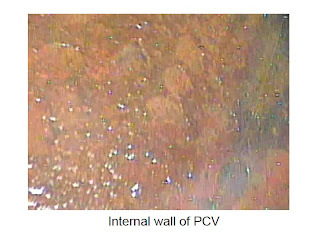 There may have been welding work in the ballast tank to add or remove solid (lead or other material) ballast to correct ship trim, or there may have been welding work to replace piping or ballast tank valves, or there may have been other work underway of another nature. It's even more clear now that the power plant (two reactors) was at no risk due to this fire. Labels: "delta IV", "dry dock", "fire", "SSBN", "submarine"
Meredith Angwin at "Yes Vermont Yankee," one of my favorite blogs, put up what is to be the last Carnival of Nuclear Bloggers of 2011 over the holiday weekend. Meredith also points out at the very bottom of the post that January 1 marks the birthday of Yes Vermont Yankee, and on this January 1 her blog is two years old. Congratulations, Meredith! We're all the better for it.